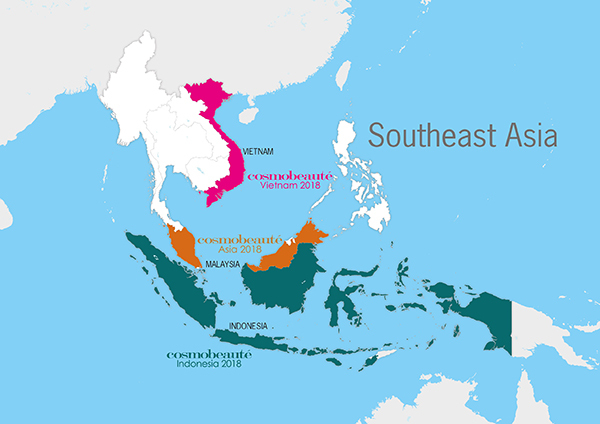 Southeast Asia (SEA) region comprised of Brunei, Cambodia, Indonesia, Laos, Malaysia, Myanmar, Philippines, Singapore, Thailand and Vietnam. The population in these 10 countries is more than 641 million which covers 8.5% of world’s population. In 2016, the nominal GDP has grown to $2.557 trillion. With the rapid growth in economy and well development, Southeast Asia became one of the most populous region for investor to expand their business. The increasing urbanized populations with higher income, modern consumer spending pattern and high awareness towards personal grooming, it is the best place to develop business here. High tourism rate from the European countries has also affected Southeast Asia’s consumer demand towards beauty care products as they are more attentive to personal appearance nowadays. Hence, Cosmobeauté is your most reliable beauty platform for you to introduce your brands into the below 4 countries!